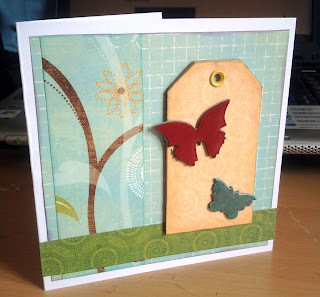 Well the first challenge over at the ATDML cyber crop last night was to make a LO or card with a tag. As I was falling asleep on the keyboard, I thought I'd wait for this morning to attempt it, and i've managed to do it in less than an hour. and that included a bit of accidental tidying half way through looking for some stash! Ooooh! I do love all things with butterflies :) Great tag Kathryn. Fab colours and LOOOVe those butterflies!